Mona Lake is a quant inland lake nestled between Norton Shores and Muskegon, Michigan. Located in Muskegon County, this 1.086 square mile body of water has some of the nicest up-scale luxury homes in Western Michigan. The hilltop views, amazing sunsets, and close proximity to Muskegon and Grand Haven events makes this a perfect place to call home or vacation during the summer. 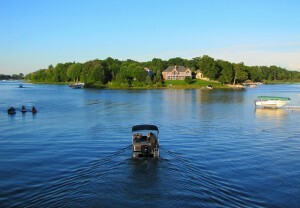 Mona Lake is one of the more private and desirable high-end, inland lakes in Muskegon County. Many of the properties are set upon hills overlooking the winding waterways creating picturesque views of the sunrise and sunset. Directly connected to Lake Michigan, Mona Lake is perfect for the avid boater who wants the calm waters of an inland lake for kayaking, water skiing, and tube but also wants the wide open freedom of the big lake. The Norton Shores area is also home to the Mona Shores School district, one of the best performing school districts in Michigan. 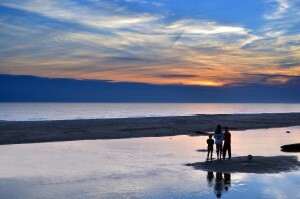 The Norton Shores area is home to some of the nicest parks in Western Michigan. Weather you want a fun place for the family to spend the day at the beach or an afternoon playing softball with your friends, Norton Shores has it all. Ross Park, located right on Mona Lake, features state of the art softball fields that can be reserved for private events, company parties, or even private leagues. This park has unbelievable views of the lake, sandy beach areas for the family, and convenient access to the highway. Lake Harbor Park, located on mouth of the Lake Michigan Mona Lake Channel, is a beautiful 189-acre park perfect for a quiet picnic or swimming with the family. 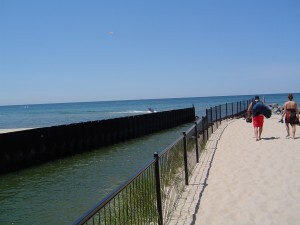 It also has a beautiful boardwalk that cuts through the dunes to expose breathe taking views of Lake Michigan. Mona Lake is home to part of the West Michigan Coastal Water Trail Experience. This water trail wraps around the entire lake giving outdoor enthusiasts a chance to take all that the area has to offer. The full loop is just over 4 miles and is fun for boaters and adventurous kayakers alike. This area is rich with culture and family friends events. Each year the city holds an art fair in Ross Park called the Norton Shores Arts and Drafts Festival. The full day of festivities begins with the Arts and Dash 5k Run followed by an arts and crafts time for families. The day is commenced with a car show and live music. Mona Lake is also home to one of West Michigan’s most active boat clubs. Being right off the highway Norton Shores and the Mona Lake area is only a few miles away from the Muskegon Lakes Mall and the Cinema Carousel Movie Theater. Being just north of the Spring Lake/Grand Haven area, Norton Shores also is just miles away from the annual Coast Guard Festival. It is also less than a 40 mile drive to Grand Rapids. If are interested in homes on Mona Lake, please check out our Mona Lake listings page to see the properties that are currently available on the lake. Please fill out our contact form or give us a call if you find a place that you would like to look at. We would be happy to schedule a showing with you.